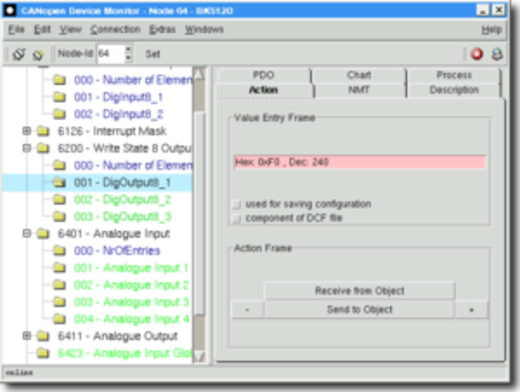 The CANopen Device Monitor is a tool for the graphical inspection and configuration of CANopen devices in a CANopen network. The embedded scripting ability makes it possible to access the implemented CANopen services and to write test or control applications with a minimum of effort. The information on how to display the device's object dictionary is obtained from the EDS (electronic data sheet) file of the device or can be scanned from the device directly. Special device configurations can be loaded, stored and scanned from DCF (device configuration file) files. The CANopen Device Monitor supports the XML-based device descriptions files compliant to CiA 311. The tab action is used for reading and writing device objects with CANopen SDO transfer messages. Supported standard actions are available for reading/writing and incrementing/decrementing of a device object. Values of manually configured device objects can be stored to a file and reloaded into the device. The NMT tab makes several fields available for the execution of NMT services like "Start All", "Start Node", "Preop All", "Preop Node" and "Scan Network". Under the tab-set description an object description of the currently selected object in the object tree is shown. Additional tabs are available for graphical representations of CAN data and can be defined by the user. With the console an interactive access to the CANopen network is possible by using commands for SDO/PDO transfers, network management services, Heartbeat and Node guarding, Time stamp and Sync. Through the scripting language all implemented CANopen communication services are available for test and control applications. Extensions to control drives according to CiA 402, a CANopen-Safety-Plugin (CiA 304) and as well as a LSS-module (CiA 305) are available, too. Port GmbH can perform special adoptions to the GUI or behavior to meet CANopen device characteristics for service or assembly testing. The usage of these software tool requires a CAN interface. CAN interfaces are currently available for USB, ISA, PCI and PC-104 or an Ethernet interface like the Port's standalone CAN-Server EtherCAN or IGW/900.